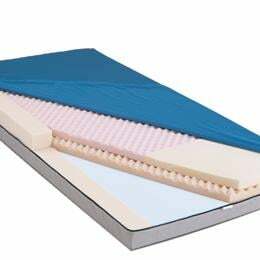 Medline Advantage "Select" Pe Mattress: Our Most Advanced Pressure Redistribution Mattress Features Our Thickest Three-Layered Design To Completely Conform To Your Resident'S Body. The Soft, Sculpted Top Layer Of Our Finest High Resiliency Foam Redistributes Pressure For Residents Up To 450 Lbs While Maintaining Its Comfort And Durability. This Anatomically Designed Mattress Features A Zoned Core To Help Cradle Bony Prominences. A Center Layer Of Convoluted Foam Promotes Air Flow To Help Manage Heat Build Up Increasing Patient Comfort. Super Soft Heel Section Features A Convoluted Design To Provide Maximum Pressure Relief, Comfort And Support. Nylex Super Stretch Premium Cover Allows The Mattress To Conform To Your Resident While Reducing Shear. Fluid Proof And Antimicrobial. Meets Federal Fire Standard 16 Cfr 1633450 Pound Weight Capacity15 Year Warranty 36" X 84" X 6.75.